New York, Nov 16, 2018 ? A masterful swimming pool painting by British legend David Hockney sold for US$90.3 million in New York yesterday, smashing a new auction record for a living artist. “Portrait of an Artist (Pool with Two Figures)” was snapped up after more than nine minutes of bidding, dominated by two rival telephone bidders. It left for dust the previous record held by American artist Jeff Koons and his “Balloon Dog (Orange),” which sold for US$58.4 million at Christie’s in 2013. 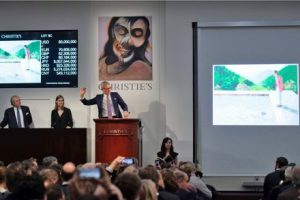 It was standing room only to watch history in the making in the packed sales room at Christie’s, where applause broke out when the epic sale concluded, the painting hammering for US$80 million. The buyer’s premium and commission took the final price for the canvas, which adorned the wall of the bidding room, to US$90,312,500, the auction house announced. The US$90 million price tag was all the more astonishing given the roughly US$20,000 that Hockney told CNN his dealer originally sold the painting for in 1972, subsequently believing it had been undervalued. Yesterday’s price was more than three times the 81-year-old’s previous auction record ? $28.4 million for “Pacific Coast Highway and Santa Monica” from 1990 at Christie’s great rival, Sotheby’s, in May. “I hope he’s not upset that we sold it for so much money,” Alex Rotter, Christie’s co-chairman of post-war and contemporary art, when asked what he thought Hockney’s reaction would be to the colossal price tag. “I’m a big fan of his,” he added. “Absolutely!” Christie’s Alex Rotter told AFP when asked if the picture was really worth US$90 million. “We weren’t the only ones going after this painting,” he said. “This is the trophy piece by one of the greatest living artists currently, if not the greatest living artist,” he added. One of Hockney’s most celebrated works, it has featured on the cover of a number of monographs about the artist and was part of an international retrospective that celebrated his 80th birthday in 2017. The observer depicts Hockney’s former lover and muse, Peter Schlesinger, one of his students at the University of California, Los Angeles. Their affair ended the year that the picture was finished and experts have suggested that the swimmer could be Peter’s new lover. Christie’s declined to reveal the identity of the seller nor any information about the buyer, insisting they wanted to remain anonymous. But Bloomberg and the Artnet website reported that it was put up for sale by British billionaire Joe Lewis, who owns the Tavistock Group, London Premier League football team Tottenham Hotspur, and whom Forbes estimates to be worth US$5 billion. Yesterday’s sale at Christie’s flagship post-war and contemporary evening art is part of biannual marquee art auctions held every year in New York in November. Last November’s season was distinguished by the single most expensive piece of art ever sold at auction ? the eye-watering US$450.3 million paid for Leonardo da Vinci’s “Salvator Mundi” at Christie’s. “When I paint, I feel I’m 30. It’s only when I stop I feel my age,” he added. “It was right here a year ago where we had the Leonardo, now we had the Hockney. Yes it wasn’t US$450 million but the concept of no reserve, the excitement in the room, the multitude of bidders,” said Rotter.